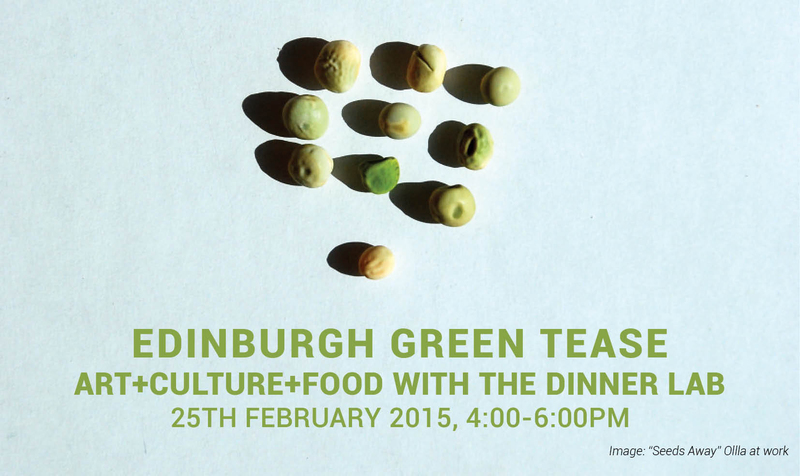 Our next Edinburgh Green Tease will take place Wednesday 25th February from 4-6pm. Join us to participate in an investigation of the city's food system, tasty nibbles included! At this month’s Green Tease, Allison Palenske (CCS social media officer and MFA candidate at ECA) will be presenting her work to-date on her project The Dinner Lab, a platform for the investigation of the cultural and ecological histories of food production. We will meet at the Edinburgh Larder Café (15 Blackfriars Street, Edinburgh EH1 1NB) at 4pm to begin an artist-led walking tour of the locations where the city’s markets once thrived, combined with edible “field” samples from local producers. The walking tour will conclude at Tent Gallery with a discussion about the artist’s role in food systems thinking, also offering participation in the final session of URBANE- an interdisciplinary participatory exhibition exploring our urban relationship to food. This session will provide a glance into Allison’s work-in-progress, offering an opportunity to contribute your thoughts toward the future of the project! As always, Green Tease is open to anyone who’s interested in how the arts can help contribute to a more sustainable city so please pass this on to anyone else you think might like to join us. Please RSVP via Eventbrite by 24th February. We look forward to seeing you there!